I liked all the ideas you guys gave me for what to do with the travel journal I picked up at Marshall's. I decided to go with RSVP which was suggested by Jim Wheeler. 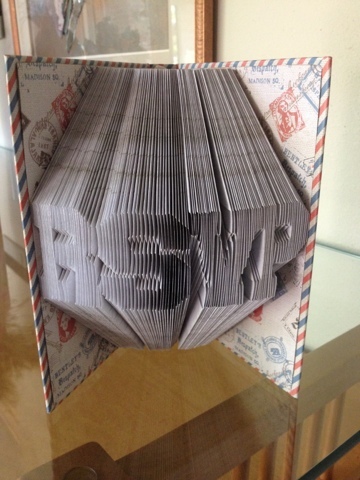 I thought RSVP went really well with the postal theme of the cover and the very cool endpapers. So here it is. I used a new font on this one that I found on Pinterest. Very bold, don't you think? It's called Freshman, and it's hard to see here, but the thick letters really shine with silver gilt during the day. I'm getting faster at making these, too. This one took me one episode of History Detectives, one episode of Antiques Roadshow, and one episode of David Letterman, so all in all 3 or so hours which includes making the pattern and doing the actual folding. Now comes the hard part--figuring out what to do with it. Some people have suggested I sell my books. Do you think people would buy them? What do you think they would pay for them? In the meantime, Jim, do you want this one?